Guess what? A couple days ago someone was walking and saw a “Fire Rainbow”. A Fire Rainbow is a very unique rainbow that looks like a very big and cool spiral. Fire Rainbows are very hard to find and are caused by light passing through clouds. They are also caused by moonlight. If you think Fire Rainbows are easy to find you are wrong. Fire Rainbows are very rare and hard to find. Barely anyone finds them. I think that Fire Rainbows are really cool and pretty. I hope that one day I will see one in real life, but that probably won’t happen. I guess I will settle on a picture for now! 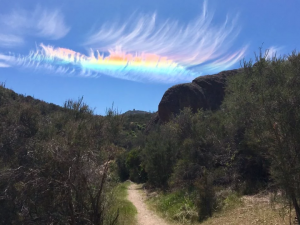 Tweet: A super cool Fire Rainbow just appeared over California’s Pinnacle National Park. I also want to see a fire rainbow in person, I like how you explained how fire rainbows happen. WOW this is . . . AWESOME I really wish I could see one of these!!! Good job Cami. You chose a very good article. Fire rainbows are very cool. I really want to see a fire rainbow. I love your blog post. I really liked your article, you did a good job, explaining it! I also really liked the sound of fire rainbows! You did a great job. I can not wait to read your next current event!